We’ll be discussing how weather affects your survey in general. If you want to learn more about how our SuperSting™ is affected by weather conditions, please read our article on AGI Help Desk. On warm days when it’s not too dry, conditions are perfect for geophysical surveys. You shouldn’t expect any weather-based delays. Get out there and enjoy the weather! When it’s extremely hot and dry outside, you can still do your survey as normal (just check the operational temperature for your equipment). However, there is an extra step you’ll need to take. If you’re using metal stakes for your surface measurement, dry weather is going to increase the contact resistance. In order to decrease the contact resistance, you’ll need to soak the earth underneath each electrode with salt water or bentonite. In extremely hot weather, use bentonite or an aluminum foil pit since water may evaporate by the time you’re ready to measure. If you’re doing a borehole-to-borehole survey, this won’t be an issue. Since you’ll be using something like a PVC sleeve and bentonite clay, contact resistance won’t be a concern. Snow and ice is highly resistive but does not affect the measurement in any other way. Snow and frost on the ground will help keep contact resistance low. Actually, the resistivity method works well for mapping permafrost. However, be sure to check your equipment’s maximum/minimum operating temperatures. For instance, our SuperSting™ can be used in most cold weather situations down to about -10ºC. You shouldn’t have many issues with doing a survey in high humidity—aside from it being really uncomfortable. Just be sure to be cautious with connectors. For our cables and connectors, we suggest keeping the caps on tight and ensuring none of the pins or connectors have moisture on them before using. You can blow out moisture (and dirt) from connectors by using canned, presurized air. Though equipment like ours is weatherproof and can technically be used in the rain, we usually advise against it to keep cable connectors dry and safe. In light rain, you shouldn’t have a problem. As mentioned above for frost, the light moisture should help keep contact resistance low. Moderate and heavy rain will affect your survey negatively. After a rainstorm, surface water will percolate down into the ground. When water moves through soil, streaming potentials are created (also known as streaming voltage), which will be recorded by the instrument—resulting in a “noisy” data. For moderate rain, expect your survey to be delayed for at least an hour after the rain stops. For a heavy rainstorm, we suggest waiting a few hours or even a full day. Really high winds could have the potential to delay your survey a bit. For example, if your electrode cables are elevated—let’s say, on a bush or something—then high winds could sway or knock them down. Even if you’re using metal stakes in the ground, if the wind is strong enough to create movement in your survey line, you’re going to see errors in your data. Thunderstorms are dangerous for you and the equipment. 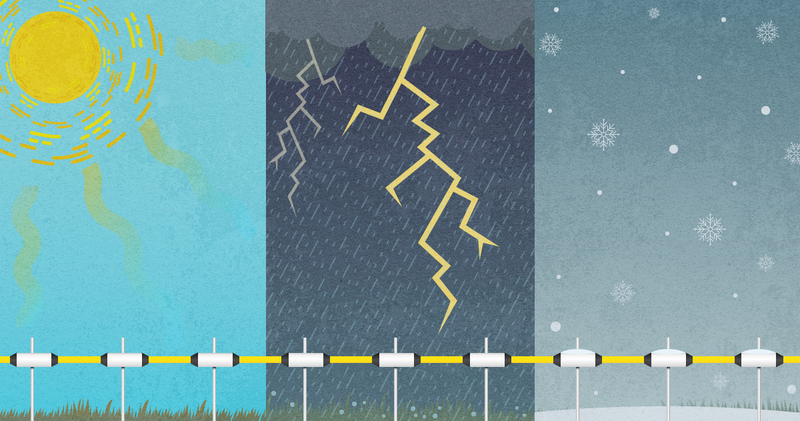 Instrumentation like ours contains sensitive CMOS circuitry and can be destroyed by nearby lightning. For yourself it is not a good idea to stand at the end of a long conductive cable during a thunderstorm. Thunderstorms typically move very quickly. So when you first hear thunder in the distance, start picking up your equipment if you've already deployed. Weather such as tornadoes, blizzards, hurricanes, tropical storms, etc., will halt your project completely until the inclement weather has passed.